This is a post on race. As such, it’s important that I acknowledge that as a white man, I have it easier in America than had I been born black. That’s just a fact. When I first heard about this I was surprised that a Starbucks would call the police for someone not ordering coffee in order to use the restroom. Partly because I can often stand in a Starbucks for EVER without being served, but that’s another story. Digging into the story a little longer I learned that the men didn’t just wanna use the bathroom, they sat at a table waiting for a friend. Now it became a little more clear as to what happened. Three guys planned a business meeting and two of them arrived early. They were waiting for their friend to arrive so that they could discuss whatever was on the agenda. All the time I meet friends for lunch or dinner and we arrive at different times. If I’m first, I tell the host that I am a party of 4 lets say, and will be waiting for the remaining three. I get sat, brought menus and I wait. This happens all the time. Now, another thing that happens all the time, is that I or someone in the family, need to use a restroom while traveling. An away baseball game, a trip to the beach, maybe driving to camp – whatever. Someone needs to go potty. When ever this eventuality happens, and I stop at a gas station, a McDonalds or where ever, I always buy something. Always. Maybe just a Coke or a bottle of water. I have, on occasion, bought something I didn’t need or want at the time, because using someone else’s bathroom is free for someone else. Back to the restaurant and lunch with buddies. So I’m early and get sat waiting for my friends. The waiter isn’t gonna give me jazz about not ordering lunch because my meal would arrive before everybody else’s and that’s silly. He may ask me if I would like something to drink – maybe I want a Coke, or a beer, or maybe, if it’s during the week, I just have water. So back to the Starbucks. The men, having been denied the code, go sit at a table when the police were called. Maybe. It’s hard to understand what happened and in what order. Did they sit down and have the cops called straight away? Did the manager ask the men if they were going to order food or coffee? Did they say that they were but just not right now? Or did they say, “no”? At the lunch table, while it’s true that I am waiting for friends and may not have ordered anything, such a scene CLEARLY has the expectation that I and 3 friends will be ordering food. And, ordering such food without my friends is outside social expectations. But a coffee shop is different. 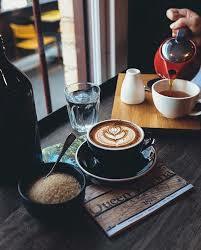 See, a coffee shop IS a great place to meet and discuss business. In fact, the last 2 times I’ve been in a Starbucks has been to conduct business – not a pleasure visit. And in each case, I arrived before my partner in one and the client in the other. In both cases I needed a table. And in both cases I ordered a coffee before sitting down. Ordering coffee while waiting for friends is not the same as ordering lunch while waiting on friends. Okay, so, that’s a long way of saying that you have to order something at Starbucks to use the bathrooms or sit at a table. And maybe the guys didn’t know this or didn’t want to have coffee or a muffin; maybe they just wanted to meet their buddy, chat and go on about their day. But the manager, I think, asked them if they were going to order and when told they weren’t, asked them to leave. And then when they didn’t, she called the police. Who, from accounts, asked the men to leave. And again, when they wouldn’t, arrested the guys for trespassing. You can get an espresso at Bread Furst, or a baguette, or a perfect piece of pie. But if you want to get some work done, be prepared: Owner Mark Furstenberg just might ask you to move along. Note, this is explicit policy. This guy is straight to the point. The James Beard Award-nominated baker sees his Van Ness cafe as a neighborhood gathering place — not a second office for ever more prevalent teleworkers. So during peak hours, when he spots laptop lurkers nursing now-cold cups of coffee and occupying precious table space, he asks them to leave. Politely, of course. And this is his policy when he sees customers nursing cold cups of coffee that they purchased, say nothing of customers occupying table space without having purchased. And how does Furstenberg handle the situation? He asks them to leave. Furstenberg doesn’t mind if people work in his shop when it isn’t busy, or if they conduct face-to-face business meetings there. It’s the ones he and other cafe owners call “campers” that get to him — you know, the types who buy one cup of coffee, plug in their laptop and earphones and proceed to act as if they own the place, hogging the tables for hours on end. Now, to be absolutely fair – the guys in Starbucks hadn’t been camping for ‘hours on end’. I’m sure it was less than 20 minutes, maybe less than 10. I saw an article that described the time as being 2 minutes. I maintain that the point remains; this is not a public space like a library is or a park is. This is a private business. A common complaint from business owners is that campers act as if they own the place. According to University of North Carolina at Greensboro marketing professor Merlyn Griffiths, they think they do. My main point is that I think coffee shops are feeling frustrated at folks who use their space. It’s a thing; not made up or fabricated by some racist barista. But a more subtle point is that in all the cases I’ve brought up, the customer was actually a CUSTOMER! They actually bought something. In Philly – those two guys never did. Now, do I think that a Starbucks manager would call the cops on me and that I would get arrested. Nope, I don’t. Maybe she called the cops and got on those guys ’cause they were black. Maybe. But I also know this – I would never have asked to use the bathroom without purchasing something, never mind sitting at a table. And if, IF, I did and the manager approached me regarding such behavior, I would ABSOLUTELY have bought a coffee. But even if I didn’t do that, there is no way, no set of circumstances, that I would have said no to a cop who asked me to leave the shop. This entry was posted in Race and tagged Starbucks. Bookmark the permalink.